Are there different types of hospital beds? Due to the great variety and range of people who suffer from sickness and ill health, this is a popular question in many hospital beds FAQ’s. The answer is a very definite yes. There are many different types of hospital beds designed to cater for a large range of people suffering from a great variety of different health issues. For example, it is possible to acquire hospital beds that are of a lower height than regular beds. It is also possible to find electric hospital beds that can shape themselves electronically to the wishes of the occupant. For example, the bed may be raised and lowered. The occupant may wish to adjust the bed to a sitting position or may wish to lie down flat. They may even wish to have their legs raised high in the air! Without a doubt there is a hospital bed designed with every type of sickness in mind for those who are suffering and who are after comfort and support. Are hospital beds only for use within the hospital? No, hospital beds can also be bough especially for use within the home. This is a popular option for those who suffer from very ill health and perhaps find it difficult to move around and yet are not ill enough to be admitted into hospital. This is also a popular option for those who require daily care within the comfort of their own home. How do hospital beds affect recovery periods? If a person who is sick or who is seriously ill is not comfortable whilst they are trying to recover, then the recovery period is likely to be a lot longer than for someone who is very comfortable and well cared for. Thus, for those who benefit from having a specialist hospital bed in which to recover, the recovery period tends to be a lot shorter as the patient is often more comfortable. A hospital bed also provides a greater level of safety. For example, many hospital beds come with adjustable bars either side of the bed to ensure one does not roll out of the bed and thus cause more health-related complications. Thus, not only will a person occupying a hospital bed recover quicker but family and friends can also rest assured that their loved one has the best possible bed in which to be safe and recover. Are hospital beds expensive to buy? 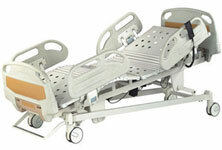 Hospital beds can be expensive to buy, especially if they are bought brand new and with a specific function in mind. In this current economic climate, it may be a struggle to buy brand new hospital beds with many people struggling to make ends meet. It is for this reason that this particular question is commonly found in hospital beds FAQ’s. However, it is possible to find cheap second hand hospital beds. These may have been previously used in a patient’s house or may simply have been discarded by a hospital in order to replace it with newer or more high-tech hospital beds. Thus, finding cheaper hospital beds is possible.